The Archeological museum of Ios was founded in 1998 and reflects modern museum philosophy. It is located in the main town (Chora) in the on the ground floor of the Amiradakio Town Halll. There is a big collection of antiquities, from all historical way of Ios, from the 3rd Millenium eg up to Roman Season. You can see Ceramics, Romans objects and inscriptions. In the museum you can also see the historic route of the island. The exhibits are separated in thematic units and in corresponding rooms, while dominate the discoveries from first - Cycladic Settlement of Skarkos. The museum is open every day, except Monday, from 08:30 until 15:00 (Tel. 22860 91246). In the near future 2 new museums will open in Ios. One will be named after the world famous painter and his wife the sculpture, "John Gaitis – Gabriela Simosi" and the second one will be named after the French intellect and artist Jean – Marie Drot. The "John Gaitis - Gabriela Simosi" museum is located near the Odysseas Elytis Theater in the main town (Chora), in a great place of relaxation and exaltation, which is filled with unique colors as the sun sets. The complex consists of three buildings and one theater with view of the Aegean. On the ground floor of the Gaitis building there is a display of his works from 1945 till 1968, when his famous faceless people were "born" and on the first floor his constructions and his faceless people are housed. Opposite is the Simosi building which also has two floors, the ground floor is a big chamber for various events and galas and the first floor accommodates the permanent exhibit of Gabriela Simosi’s sculptures. On the "Friends of the Art" building a permanent collection of their "Friends of the Art" generation artworks will be sheltered. The complex museum gives its visitor the opportunity to walk in its beautiful chambers and terraces and discover the unique view to Chora, the harbor and the endless Aegean Sea, as well as the garden with the cypresses, olive trees and oleanders. The French philellenist Jean - Marie Drot, director - writer and artist has loved Ios and built a house - beacon in the waves of the Aegean Sea in the area Ai Giannis (1964). He has recently decided to house part of his collection of modern arts in the museum he has build besides his house. The collection consists of artworks from Greece, France, Italy, Haiti, Poland and other countries. The form of the exhibits varies, including paints, prints, sculpts and photographs. In the museum there is a collection of folklore art and naïf art from all over the world, which are exhibited in a homiest atmosphere with furniture from the Cyclades and other parts of Greece. The island has 365 churches as many as the days of the year, most of them are Byzantine and more than the half of these are visit able. One of the characteristic is the marmare cross and in the small churches in country the stone cross. Everything is painted white, to resist the merciless heat of Greek summer, with blue or green doors and windows to rest the vertical and horizontal lines, softened by gentle curves combining the blue of the Aegean Sea. Right at the port of Ios is the picturesque church of Agia Irini at the right of its entrance, built in the 17th century. It's a peculiar structure with two altars, one older than the other, that were supposedly used for the Orthodox and the Catholic cults respectively. (Our Lady of the Cliffs) The top church of Chora which is recognized by the palm tree. It was built during the years of the Turkish occupation. According to one tradition, an icon of the Virgin was found among the rocks of Mylopotas' seashore, with a lit candle standing on it. The legend has it that the inhabitants of Crete had thrown the icon in the open sea to protect it from falling to Turkish hands, and that the waves had carried it to that coast. The icon was then taken to the church of the Holy Cross, but only to be found again the following morning on the same steep mountainside. When the islanders tried to build a new church for the icon, but not on the exact spot where it had been found because of its inaccessibility, the foundation stones of the church kept disappearing every day in a miraculous way. It was only then that the islanders understood that the icon had chosen that exact spot, because it was the only one from where the dim shape of Crete could be viewed. On this piece of rough land they built the new church, known today as Gremiotissa, with its miraculous icon. A little beyond this church you can see the ruins of the castle walls and enjoy the magnificent view of the port and of Vigla. If you walk towards the northern side of the castle, you will come across the ancient walls again. (Annuciation) is the modern Orthodox Cathedral of the island which stands in the first square of Chora. Stands near by Evangelismos. In 1903 an excavation unearthed the remnants of Byzantine foundations and the ruins of an ancient temple dedicated to Apollo. Above these ruins the Christians built the Byzantine Cathedral, whose altar rests upon tow of the temple’s columns. From the square of the mills, you can follow the narrow street that goes up to Prophitis Elias. 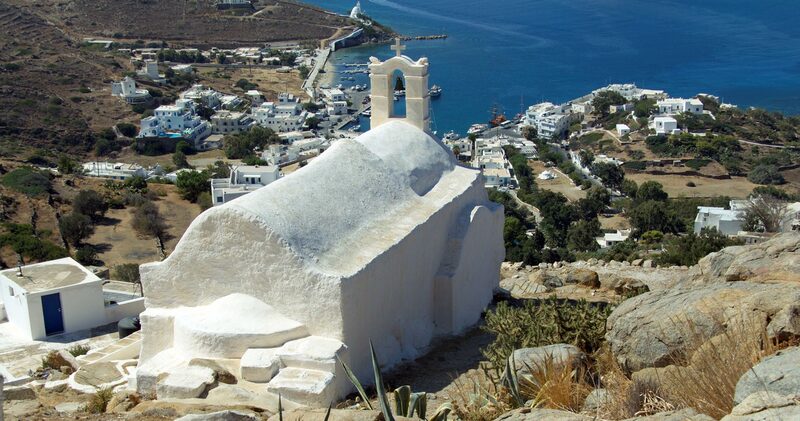 A path of 500m., with magnificent view to Chora and to Mylopotas, leads you to the church of Prophitis Elias. In periods of water shortage, a procession with icons and banners is made along this path towards the church. The 16th century church of Agia Theodoti is the oldest on the island. On the highest pick of the island (713m) stands the 16th century Byzantine church of Agios Ioannis, built on the ruins of an ancient temple dedicated to Apollo.